Hi loves! How have you all been? 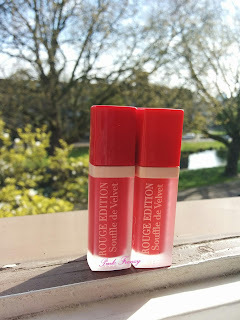 Today I'm happy to share new liquid lipsticks in my life. 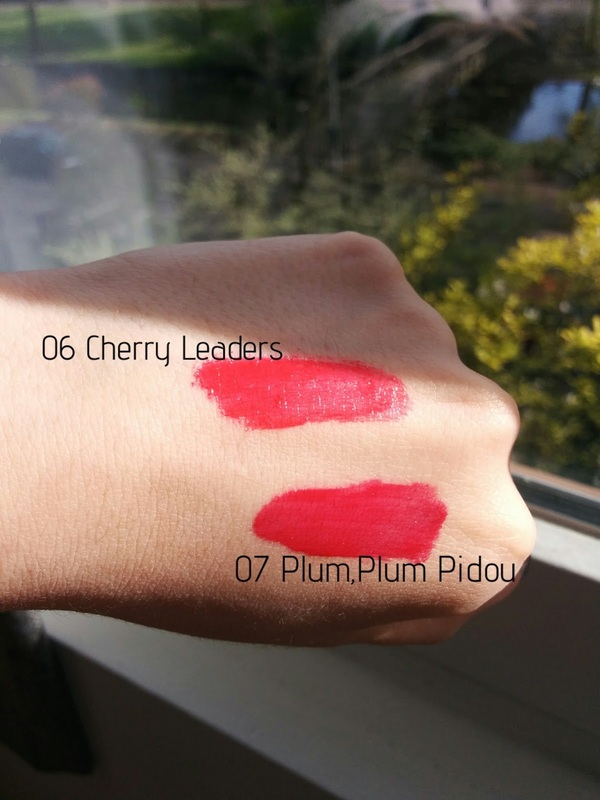 I picked up 2 shades from Bourjois Rouge Edition Souffle de Velvet range and the shades are 06 Cherry Leaders and 07 Plum Plum Pidou (7.7 ml, 12.50 EUR). These come in a clear tube, which means I can see the shade of the liquid lipstick. I also like the caps are the same color as the lipsticks itself. The applicator of these is standard doe foot applicator. Its not too big, so applying the product is comfortable and easy. The formula of it feels really, really nice on lips. Its light weight and doesn't dry out my lips. It claims to hydrate the lips for 10 hours and I think it does hydrate the lips. Both shades are beautiful reds. They might seem the same on the picture, but real life these are different. One has more pink to it and the other is bit deeper and more red. For me it was hard to get even coverage with these and these lasted on me only 3 hours (and I didn't drink or eat). I feel like I always have to check, if I need to reapply. It does claim to last all day, but it wasn't the case for me. Maybe it was because I tend to lick my lips. These also have a scent to them. It just smells like perfume, which might bother some beauties. I do smell it only when I put my nose close to the tube. Other then that I didn't smell the scent and it doesn't bother me. Have you tried these already? They look almost the same colour in your swatches to me.